Bartonella bacteria are gram negative (have a double cell wall), are slow growing, come in different shapes, and are very difficult to isolate in the lab. They can live inside cells and in isolated locations in the body, protected from the immune system and antibiotics. Inside an average medical textbook you will find references to three conditions caused by bartonella, cat scratch fever (Bartonella henselae), trench fever (Bartonella quintana), and Carrion’s disease (Bartonella bacilliformis), but research over the past 20 years has shown that bartonella is quite a bit more complex. There are actually many species of bartonella that are widespread in all mammal populations (including whales and dolphins). More than a dozen species have been isolated that can infect humans. Bartonella is typically spread by biting insects (fleas, ticks, mosquitoes, sandflies, lice, chiggers, biting flies, scabies, mites, and even louse-eating spiders), but can also be transmitted by contaminated bites (of animals), scratch (cat scratch), and ingestion. Infection by any bartonella species is called Bartonellosis. The most common bartonella (as far as anyone knows) is Bartonella henselae. It is the cause of cat scratch fever. Classically, a scratch from a cat carrying B. henselae develops a rash followed by symptoms including low grade fever, headache, sore throat, and conjunctivitis about 3 to 10 days after the scratch. Swollen lymph nodes are typical and takes weeks to months to subside. Symptoms are not generally debilitating and resolve without treatment in most cases. Classic cat scratch fever is common with over 20,000 cases reported each year. About a third of domestic cats are carriers, along with their fleas. Of course, cats are commonly bitten by ticks, and B. henselae is readily transmitted along with other tick-borne microbes. When bartonellosis with B. henselae is caused by an insect bite (ticks, fleas, mosquitoes, etc) the symptom complex is less well defined and highly variable. Most cases are not reported and the actual incidence of B. henselae infection may be 10 or 100 or even a 1000 times greater than that reported for classic cat scratch fever. Beyond cats, B. henselae is also carried by dogs and other mammals including humans. Different studies of human populations around the world have shown that the carrier rate for B. henselae in asymptomatic individuals is anywhere from 10 to 30% (test positive for active carrier state). Bartonella quintana, another common species of bartonella, is the cause of trench fever. The name comes from the trenches of WWI where soldiers lived in desperate and debilitating conditions. B. quintana, spread by body lice, causes symptoms of severe fever, headache, muscle aches, leg and back pain, skin rashes, conjunctivitis, and rarely, heart failure. Today, B. quintana is common in homeless people; again, transmitted by body lice. About 10-20% of homeless populations (3.5 million people in the US) harbor chronic infection with B. quintana. B. quintana can be transmitted directly by the bite of a louse, but also by infected bodies of dead lice scratched into abraded skin. B. quintana becomes tightly interwoven into the feces of the louse, which also is a transmission vector. Louse feces bound bartonella is infectious for more than a year and can be inhaled or ingested with dust particles. B. quintana has also been found in cats, dogs, monkeys, gerbils, rats, and can also be transmitting by other insect vectors. After entering the body (by whatever means), bartonella infects specialized white blood cells called CD 34+. These blood cells are precursors for cells that line blood vessels and other tissues (endothelial cells). The microbe enters the cell and creates a cyst around itself (called a vacuole) to gain protection. It also turns off the ability of the cell to self-destruct. Chemical messengers stimulated by bartonella microbes cause more CD 34+ cells to congregate. These messengers simultaneously suppress other key parts of the immune response. CD 34+ migrate throughout the body and replace damaged endothelial cells. This places bartonella exactly where it wants to be. Once established inside blood vessels, bartonella starts scavenging red blood cells as a nutrient source. While all of this sounds highly threatening, B. henselae or B. quintana are actually not highly virulent microbes. If the person’s immune system is healthy, the cells of the immune system quickly gain the upper hand, and microbe is dispatched within a couple of weeks. After a brief low grade illness, the person is back to full health. Because the illness is rarely debilitating, a doctor and the healthcare system are generally not involved and a formal diagnosis is never made. If immune function is not up to par, however, chronic low grade infection can occur. It occurs insidiously; the person has a low grade illness initially, but then never gets completely better. Degree of debility is variable and dependent on immune status. It is possible (even common) to have chronic infection without having noticeable symptoms. 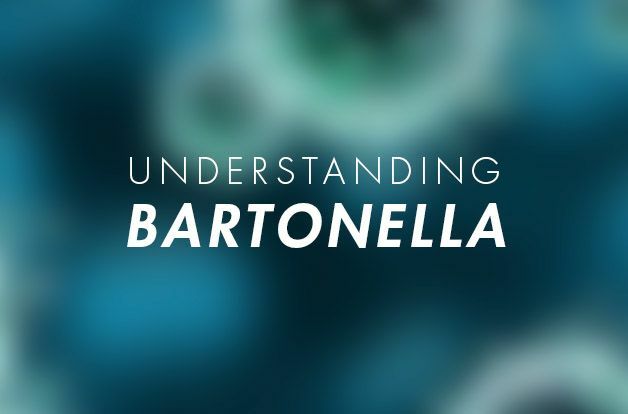 Bartonella gains protection from the immune system by invading cells lining blood vessels. Symptoms are mostly related to damage caused to small blood vessels (small vessel disease). Types of symptoms are related to the organs involved. Typical organs that can be affected include the liver, spleen, bone marrow, eyes, skin, and the entire vascular system including the heart. Skin rash at the site of initial infection, low grade fever (100-102), and swollen lymph nodes (near the initial infection site) are hallmarks of initial infection. Lymph nodes can be filled with pus and drain in severe cases. Other common symptoms include severe fatigue, muscle pain, body aches, and eye infection (conjunctivitis). Liver and spleen enlargement can occur acutely and with chronic infection. Chronic infection can be associated with relapsing low grade fever. Chronic eye problems include blurred vision, photophobia and eye irritation. Bartonella commonly infects bone marrow with resulting bone pain. The most common location is the shin bone. Another classic bartonella symptom is pain in the soles of feet upon waking in the morning. This is associated with trauma to blood vessels in the soles of the feet with walking. Ankle and knee pain, one side or both, is also relatively common. Anemia can occur from bartonella scavenging nutrients from red blood cells. Small vessel disease can affect the brain and nervous system. Headaches are not uncommon. Depression and rage may be linked to chronic bartonella infection. Other neurological symptoms include poor balance, brain fog, decreased cognition, memory impairment, insomnia, and restlessness. The results in poor stress tolerance and anxiety. Demineralization of teeth and jaw can cause chronic face and neck pain. Chronic bartonella infections are associated with higher rate of root canals (compromise of small vessels supplying the tooth). Transient tooth pain is not uncommon. Small vessel disease can affect function of the autonomic nervous system (sympathetic and parasympathetic systems) resulting in postural orthostatic tachycardia syndrome (POTS). Chronic bartonella infection affects the entire vascular system. Infection of cells lining the heart (endocarditis) can cause chest pain, shortness of breath, palpitations, and in some cases, damage to heart valves. Respiratory symptoms can include unexplained cough. Bartonella can affect the urogenital region causing irritable bladder, kidney disease, pelvic pain, and infertility. There is evidence that bartonella can be passed during pregnancy and between partners. Severely immunocompromised individuals (mainly AIDS) can develop cranberry-like skin lesions from proliferation of infected blood vessels under the skin. Chronic bartonella infection can be associated with abdominal pain, loose stools or constipation, and general intestinal function, but this may or may not be specifically caused by bartonella. Symptoms are highly variable and often not severely debilitating. The spectrum of symptoms widely overlaps with other low virulence microbes. An average doctor would mark it off as simply aging and offer only prescriptions to control the symptoms, nothing more. Research over the past twenty years has revealed bartonella species other than B. henselae and B. quintana. New ones are added to the list every year. A partial list includes B. clarridgeiae, B. elizabethae, B. vinsonii, B. berkhoffi, B. grahamii, and B. washoensis. Other bartonella species cause similar symptom profiles as the two better known bartonella species and are somewhat interchangeable. In other words, other species of bartonella can cause cat scratch fever or trench fever. All bartonella species infect mammals via biting insect vectors. Ticks are known to transmit several different species of bartonella. Bartonella is so prevalent that most people will cross paths with some form of it during a lifetime (but in most cases never know it). With only one known exception, bartonella bacteria meet all the characteristics of low virulence microbes. Like other stealth microbes, bartonella is not much of a threat by itself. Virulence is additive, however; coinfection with multiple low virulence microbes can result in significant chronic illness. Bartonella occurs as a coinfection in at least 25% of Lyme disease cases. Indirect fluorescence assay (IFA) tests for antibodies (IgG and IgM) to bartonella. IFA is not very sensitive because antibodies levels tend to be low. Also testing is species specific and generally only tests for the most common species of bartonella. Frye Laboratories (Scottsdale, Az) offers both IFA and standard PCA. Standard PCR tests for bartonella DNA in the blood. Because concentrations of the microbe are very low with chronic infection, this test is unreliable. Galaxy Diagnostics (Research Triangle, NC) performs an amplified version of PCR called ePCR that is more reliable. The presence of bartonella in blood is amplified with special culture media and then tested with PCR. The test takes 2-4 weeks to perform and tests for all known forms of bartonella. As a general rule of thumb, positive testing can help direct therapy, but a negative test does not rule out the presence of bartonella. The expense of testing must be weighed against money directed at comprehensive therapy. As with other low virulent microbes, sometimes it’s best just to assume that it is there and develop a comprehensive recovery protocol that covers for it. Some people with chronic infection do respond to conventional antibiotic therapy. As a general rule two antibiotics at one time are superior to one, most commonly doxycycline and rifampin for 2 to 4 weeks. Individuals with serious or debilitating symptoms such as those consistent with endocarditis should be evaluated by a healthcare provider and should receive antibiotic therapy. Antibiotic resistant bartonella are common and because the microbes are slow growing, occur in low concentrations in the body, and concentrate in areas where antibiotics do not penetrate, nonresponders are common. Many people who do respond relapse later. The best alternative solution is supporting the natural healing potential of the body. Artificially created food products, petrochemicals and other toxics, artificial sources of radiation, and the stress of modern life disrupt immune function and allow low virulence microbes like bartonella to flourish. Minimizing these factors is an essential step for controlling the present epidemic of chronic diseases like Lyme disease, fibromyalgia, fatigue syndromes, and autoimmune diseases. Natural herbal therapy offers a good alternative for chronic bartonella infection. Herbs reduce inflammation, restore normal immune function, and suppress a wide range of stealth microbes. Bartonella have very low potential to cause Herxheimer reactions. The outer coat from dead bacteria is much less reactive than most other bacteria involved with Lyme disease. The bacteria does not form biofilms, but can form vacuoles that are similar in the liver. Generally vacuoles are broken down by the body when healing occurs. All of the known species of bartonella have low potential to cause severe acute disease. The one exception is Carrion’s disease, caused by Bartonella bacilliformis. It is a highly virulent microbe that only occurs in the Andes regions of Peru, Ecuador, and Colombia. A bite from a sandfly transmits the bacteria, causing a high fever (called Oroya fever). This is accompanied by severe anemia from destruction of red blood cells, severe enlargement of spleen and liver, bleeding into lymph nodes, and destruction of blood vessels. Mortality is 40% without treatment. Bartonella bacilliformis is an exception compared to other species of bartonella, but fortunately it holds to the rule that higher virulence microbes tend to be uncommon or rare. Dr. Rawls is a physician who overcame Lyme disease through natural herbal therapy. You can learn more about bartonella in Dr. Rawls’ new best selling book, Unlocking Lyme.